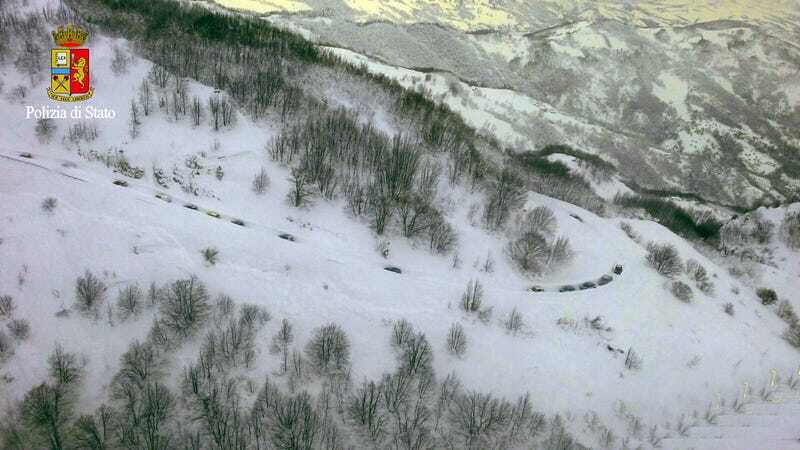 As many as 30 guests are missing following an overnight avalanche at a hotel in Italy’s Gran Sasso mountain area. Poor weather conditions and the remote location of the hotel are making rescue efforts difficult. 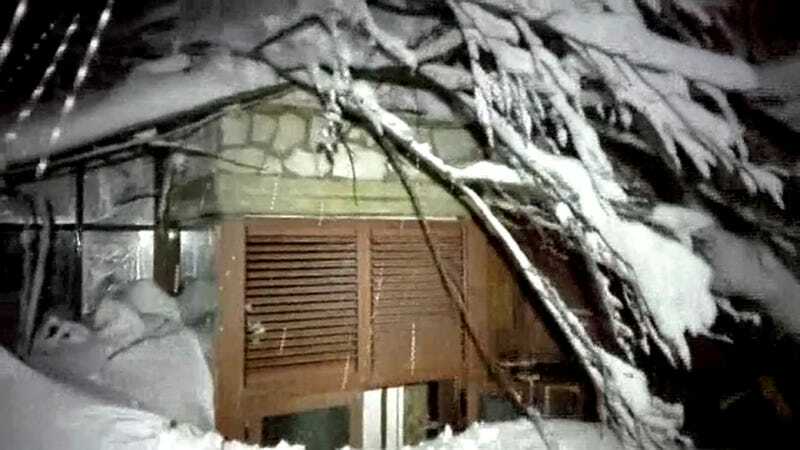 The avalanche smashed into the Rigopiano Hotel in the early hours of the morning while guests were asleep. The first mountain rescue teams, arriving on skis, didn’t reach the hotel until 4:00am local time—several hours after the avalanche had struck. Roads leading into the site were blocked by 7 feet (2 metres) of snow, making it impossible for ambulances and other rescue vehicles to access the site. Frigid conditions and a fierce snowstorm complicated rescue efforts even further. 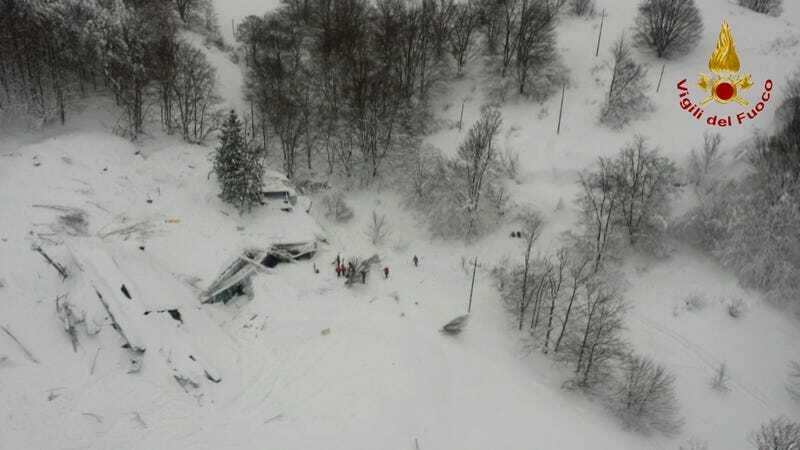 Communication with the Rigopiano Hotel came to an abrupt halt after the avalanche, but some guests were able to send messages. “Help, we’re dying of cold,” read one text, reported Ansa. Another message read, “Some walls were knocked down,” and “I’m outside with a maintenance worker but can’t see anything of the hotel, there’s only a wall of snow in front of me.” Without electricity and heat, it’s feared that some guests might have succumbed to the frigid temperatures. Once daylight arrived, rescue teams were being delivered by helicopter. Rescuer Antonio Crocetta told Reuters: “We’ve called out but we’ve heard no replies, no voices.” By noon local time, only two survivors had been found, and one person was confirmed dead. Officials fear that there are “many dead” in the hotel. “The structure has collapsed, it’s more like a pile of rubble than a hotel,” said Crocetta. Footage of the site shows snow surrounding the four-story, four-star hotel; shots taken from the interior show piles of snow and debris bursting through the walls. 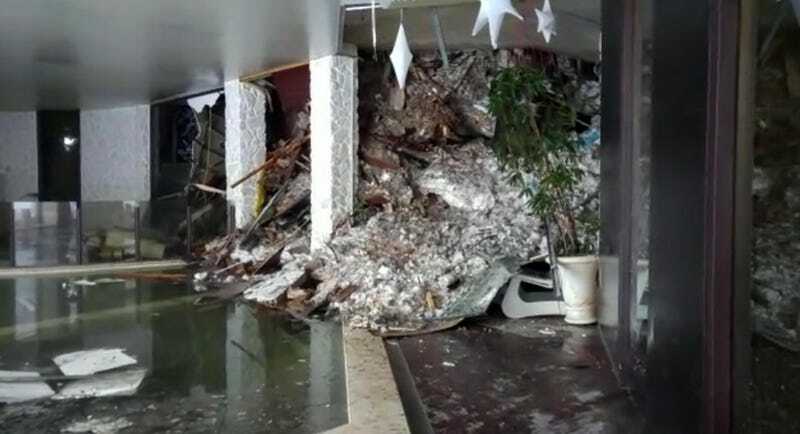 It’s not known how many guests were staying at the hotel when the avalanche struck. A line of rescue vehicles make their way to the hotel. (Image: Italian Police via Associated Press.